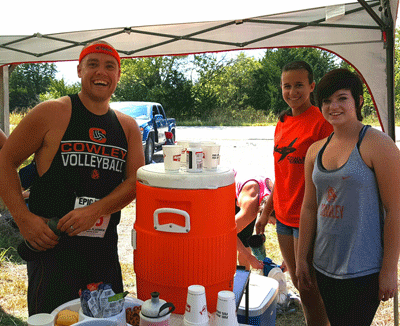 Ten students in Cowley College’s Academic Civic Engagement through Service (ACES) organization volunteered to work the aid stations at the Epic Ultras Flatrock 50K and 25K races Saturday, September 26 at Elk City Lake in Independence, KS. The trail races reached over 3,000 feet of cumulative elevation change throughout the run and is the oldest trail ultra-marathon in Kansas. Ben Schears, Cowley College vice president for institutional advancement, took part in the 50K (32-mile) race for the fourth consecutive year. Schears’ involvement in running the race led to a friendship with Epic Ultras founder Eric Steele, whose race company set up the race and other ultra-marathons around the state. Their friendship led to a partnership with the Cowley College ACES program and the director James Fry. Epic Ultras provides a contribution to the ACES program through the Cowley College Foundation for each race the students volunteer. The ACES program then uses the funds for a food packaging program that benefits the hungry. Schears wife, Rachel, and Lea Newman, Cowley College Health Services Coordinator, competed in the 25K race. Those pictured are, from left, Ben Schears, and ACES students Haley Nevin and Erika Bowman Bekemeyer.